Beautiful log siding from ABC Seamless of Albuquerque can help you effortlessly match the authentic look of homes in the mountainous regions surrounding Tijeras, New Mexico. Yet as with all of our seamless siding, this log variation requires very little maintenance because its finish is designed to stand up to years of intensive UV exposure, rain, hail, and any other weather conditions. This means that you will never need to stain, paint, or scrape your new siding once it is installed. Additionally, when you purchase siding from ABC Seamless of Albuquerque you can expect the best energy efficiency offered on the market today. 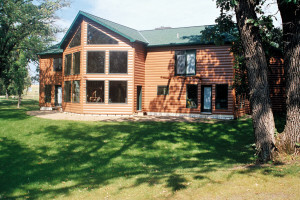 Our log siding comes installed with foam-backed insulation which fits into each individual log contour. This will reduce the transfer of heat both into and out of your home, putting less stress on your HVAC system and saving you money on your monthly energy bill. If you are interested in learning more about the log siding offered by ABC Seamless of Albuquerque for your home in Tijeras, NM, or a surrounding area, contact us today. Also, feel free to stop by our large showroom, which is open Monday through Friday or any time by appointment, to see any of the products we offer in person.